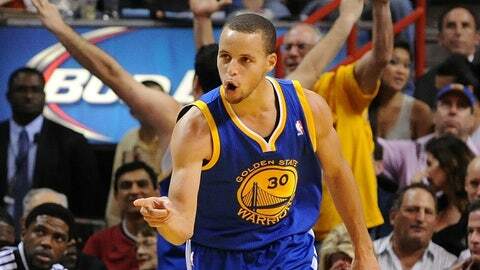 Warriors point guard Steph Curry hit 13 of 22 shots overall, including 8 of 15 from behind the 3-point line. MIAMI — Miami has seen its share of exceptional individual performances in recent years, often courtesy of one of the Heat’s Big Three. Not so on Thursday night, when Golden State guard Steph Curry scored 36 points and dished out 12 assists to lead the Warriors to a 123-114 victory against the two-time defending NBA champions. Curry hit 13 of 22 shots overall, including 8 of 15 from behind the 3-point line. "He put on a clinic," Heat coach Erik Spoelstra said. Two stars combined for 68 points and led their team to victory Thursday night. LeBron James and Dwyane Wade? Wrong players, wrong team. Before the game, Warriors coach Mark Jackson said his fifth-year point guard had the green light to shoot. Lebron James begged to differ. "It’s more than green, it’s fluorescent," James said. Curry had two layups among his baskets, with all the others coming from 19 feet or farther. "A few times we were in his jersey and he made shots," Dwyane Wade said. "He’s obviously one of the greatest shooters in this game, and he hasn’t even started yet — he’s early in his career." "He’s a special player. He’s a guy you can win with, and win big with," said Shane Battier, one of Miami’s long-distance specialists. "He’s a franchise guy, a true franchise guy." Which probably is why Heat players didn’t appear or sound overly bummed about the nine-point home loss. They chalked it up to facing one of the game’s great marksmen who, as Wade said, "was on fire." "Definitely," point guard Mario Chalmers said. "Were not going to worry about this game. We got another one Saturday (at Orlando), we’ll get ready for that one." "You can’t stop somebody from shooting it," backup point guard Norris Cole said. "All you can do is contest them hard and live with the result." Chalmers led Miami with seven boards, partly a result of a bunch of long rebounds. The Warriors shot 56.1 percent overall (46 of 82) and 51.7 (15 of 29) from 3-point range. "That’s an amazing, amazing, efficient number," Batter said. "To make that up on our end, we had to do some pretty amazing things. We scored 114 points and we were just OK offensively. That’s the power of the 3-point shot." Jackson recently called Curry and guard Klay Thompson (16 points, 4 of 9 from long distance) — nicknamed the Splash Brothers — the greatest shooting backcourt in NBA history. The former Davidson star certainly did his part at the Triple A to support his coach’s sentiment. "I looked at the stat sheet at one point and Curry was 7 for 13 from the 3-point line and I was 7 for 12 from the field," said James, whose 26 points paced Miami. "He’s one of the best shooters this NBA will see. To be in the building with two of the greatest, him and (Miami’s) Ray (Allen), not bad, not bad." Unfortunately for the Heat, shooting is just one part of Curry’s talented game. 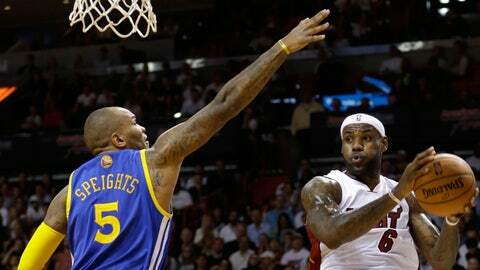 "If he wasn’t making shots, he was making assists," James said. "He definitely controlled the tempo of the game." "Not only was he hitting those shots — I think he always knows he can go to that — he was being pretty unselfish, getting David Lee right in his comfort zone," Chris Bosh said. Lee finished with 32 points and 14 rebounds, yet clearly was overshadowed by his sharpshooting teammate. Perhaps the Heat also were relatively upbeat following the loss because they knew they won’t have to face Curry and the Warriors in the Eastern Conference playoffs. Asked if he could imagine Miami having to defend Curry in a seven-game series, Wade replied: "I would love to. That would mean they’re in the NBA Finals and we are."